National Convention Centre – Car park signage- Constitution Ave CBD- Canberra STATIC BILLBOARDS- wall mounted Alu-Panels 5 billboards in key Catchment areas- basement car park – Entertainment Centre. 225,000 cars a year. Niche target market. Wall Size- 5 key locations with two sizes 2m x 1.8m – 4m x 2m Targeting public servant daytime Casino customers. 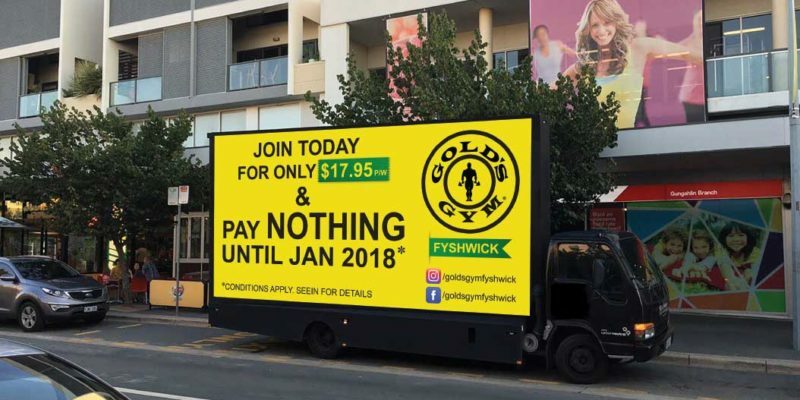 GUNGAHLIN MARKET PLACE – Hibberson street Gungahlin -The Market place shopping centre GUNGAHLIN MARKET PLACE – Hibberson street Gungahlin -The Market place shopping centre STATIC BILLBOARDS- wall mounted Alu-Panels & back-lit static billboard. 5 billboards in key Catchment areas- basement car park – Entertainment Centre. 6 Million cars per Niche target market. Woolworths, Kmart, Big W and many speciality Wall Size- 3 key locations with sizes 7m x 2m Targeting public servant and the fast-growing suburb of Gungahlin. Walking boards Take your message to the point of sale. Walkers can also hand out brochures and samples. BIKE BOARDS Moving messages with zero emissions 3 sided for 360 degree view. Riders can hand out brochures and product sampling. Can be utilised on walk ways and foot paths. High reach ability and able to engage with target market directly. NCC – National Convention Centre- Constitution Avenue Canberra CBD. Large CBD Digital LED screen- size 20.15 m2. Every Canberra resident knows this LED site. They haveCome to expect a message. What do you want to say? Exposure to more than 30,000 cars every day. The only large LED site in the heart of Canberra. Your ad appears a minimum of 480 times a day. Space is limited to achieve high frequency of the media exposure- Max 12 ads. Digital Flexibility to change your ad every week. Specs: JPEG 1280 wide x 720 height. 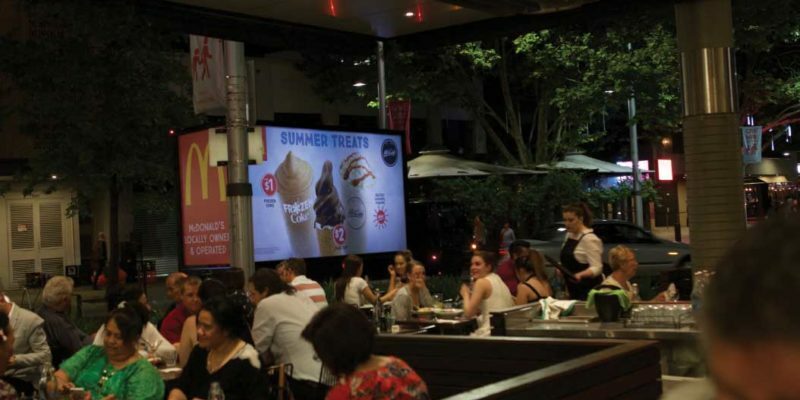 Canberra City CBD -Bunda street 3 x LED screens- 1 m2 per screen. Right in the heart of the Canberra business district. Advertise where it’s all happening. 3 x LED screens are located opposite high traffic Canberra Centre, busy café’s, bars and restaurants. Public service and retail foot traffic. The only LED sites in civic. Diverse demographic. Your ad will run 504 times a day. Flexibility to change artwork every week. 10 ads max- ad duration 10 seconds. Specs: 1280 wide x 720 height. 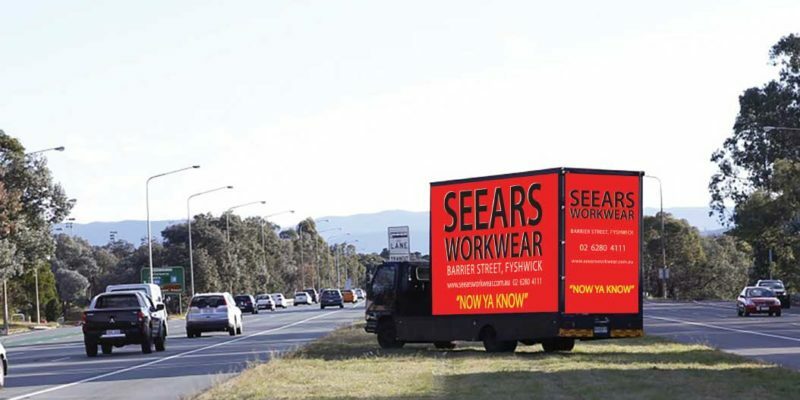 Seears workwear- Barrier Street Fyshwick. 1 x LED Screen- Size 5.12 sm2 Target the trade demographic- Fyshwick is the trade capital of Canberra. Advertise where they all shop. Flexibility to change artwork w 8 ads max -ad duration 30 seconds. Specs: JPEG 1280 wide x 720 height Pixels. MOBILE BILLBOARDS Looking for a ground-breaking way to promote your business or event? Big Impact’s Mobile billboards are available for your business with the powerful ability to brand or promote your business. 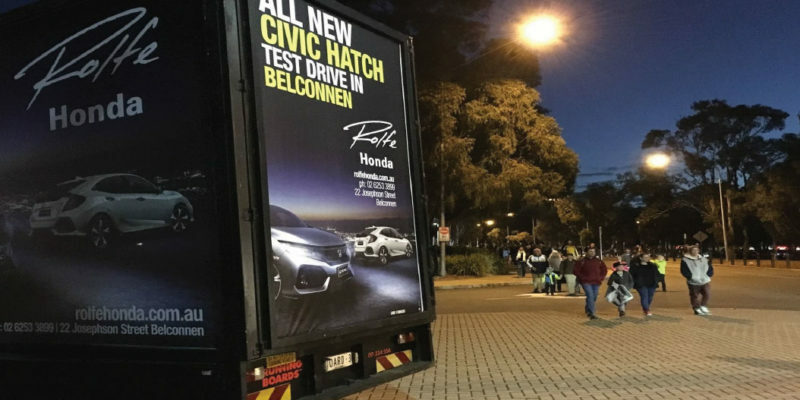 These mobile billboards have high impact and are professionally presented which allows you to take your message to the streets reaching a wider audience and target market. Our mobile billboards are proven to draw attention. People will take notice of your brand or promotion and by seeing it in such a manner, they will have a higher chance of remembering your important message. Recall and frequency is achieved by using these mobile billboards. Mobile Billboard 1- MB1 The MB1 further enhances the viewer’s experience. This is achieved by adding in LED internal lighting for night activity/events and scrolling technology that allows the ads to scroll. MB 1 attracts attention by being backlit and scrolling through 5 ads each 40 second. This will allow you to continue taking your brand to your consumer at any time anywhere. With such varied ways of attracting attention, you can be certain that you will be noticed by many of your target market. Further information – MB 1: Your ad will be displayed on 4 sides of the vehicle. Sides – 3 meters wide x 1.5 meters high- Back 1.5m x 1.5m. Front 1.5 w x.450 H. MB1 holds up to 5 clients – scrolling evenly and promoting you across the region. Minimum booking is 4 days per week at $250+GST per day. Mobile Billboard 2 non backlit- Sides 6 metres long x 2.6 meters high – Back 2.2 W x 2.6 H Take your brand directly to your target market! MB 2 has a very strong, distinct presence on major highways around Canberra and Queanbeyan. This advertising medium boosts recall and encourages impulse buying decisions. Utilise this Mobile Billboard at your next big sale or promotion to be noticed like never before. If you want the Canberra market to remember your sale, promotion, and brand, book MB 2 today because Size does matter! The Long Media Vehicle serves the function of a billboard but on wheels. The billboard is static giving your brand ultimate exposure all day. MB 2 is great for brand building or brand revitalisation. Mobile Billboard 3 – 9 Sides 6 metres long x 3 meters high – Back 2 W x 3 H Backlit large format static billboards. The largest of our media vehicle fleet also with backlit technology. You cannot miss MB 3-9 with the ability to go all through the day and night. Reach out to your potential customers on the roads and at events throughout Canberra. 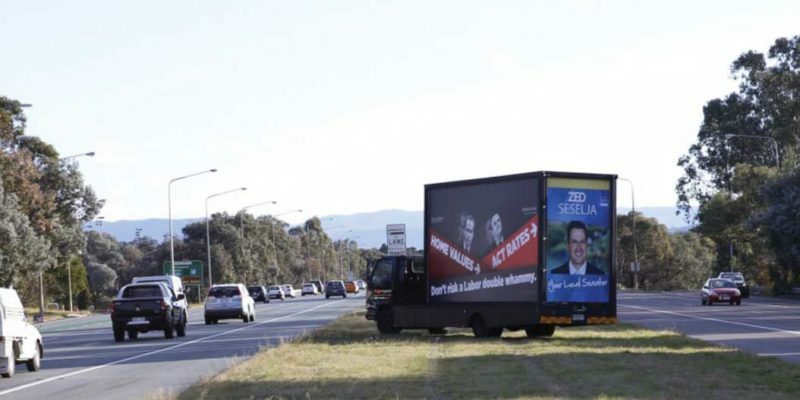 The only backlit large format mobile billboards in Canberra. Excellent branding Mobile Billboards. Flexibility to target high traffic roads.